Birds are one of the most beautiful and popular creatures in the wild. They are enjoyed by people around the world. They are an extremely diverse class of animals. Birds are found living in amazing and diverse places, from penguins in icy Antarctica to roadrunners in the desert. 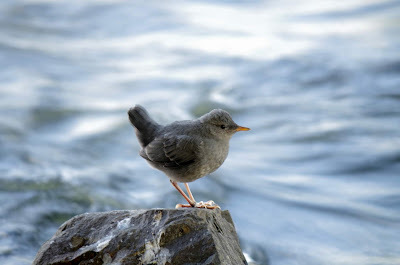 One of the most unique birds is the American Dipper (Cinclus mexicanus). This small bird is native to the western North American continent. It is a small robin size bird that has a round body and small head. It is usually all grey with white on the edges of its feathers. Sometimes they have a light brown head. They are a seemingly unimpressive bird on first appearance. After watching these special birds hunt for food one will soon realize how unusual they are. American dippers live in mountainous areas. They make their home along mountain streams and creeks. They spend all their time close to these streams. These birds are amazing water birds. They hop along the edges of their stream and repeatedly dip their heads in and out of the water looking for insects and fish eggs to eat. They also plunge into deeper water and use their wings to dive and swim down to the bottom and hunt among the rocks for food. The most amazing aspect of American dippers is their ability to walk along the bottom of the stream, even in deep water. Dippers have special claws on their toes that help them hold onto the rocky creek bottom. They can remain on the bottom under water for up to thirty seconds. These special birds have unique anatomy and body structure that allows them to be good swimmers. Clear eyelids cover their eyes and scales cover their nose when submerged under water. Strong short wings allow them to swim underwater and fly in the air. Extra oily feathers provide a waterproofing that help them shed water better than other birds. A slow metabolism and blood capable of storing a high concentration of oxygen help them tolerate the cold waters of mountain streams. All of these remarkable traits allow Dippers to find food where few other birds can by diving and walking under water.1 They live and eat where one would least expect. Even if food is scarce in other parts of the forest and other birds struggle to find food, this bird is able to rely on a completely separate and unique source of food because of God’s design for it. Towards the end of the life of the Apostle Paul he felt the Holy Spirit calling him to go and preach in Jerusalem. Up to this point he had avoided Jerusalem in his missionary journeys because he knew there were people there who wanted to discredit and even kill him. He did not fully know God’s plan, but he had learned to trust God would care for him where ever he was. Paul decided to follow the Holy Spirit and go even though he knew he would probably die there (Acts 21:12-14). Just as Paul guessed, he was arrested and charged with crimes in Jerusalem. He knew that he would never get a fair trial there so as a Roman citizen he appealed to a trail by Cesar, King of Rome. Paul was granted this request. He traveled all the way to Rome and lived under house arrest for two years awaiting to be tried by Cesar. Because of this, Paul was able to witness to many people on his way to Rome whom otherwise would not have heard the Gospel. While on house arrest for two years Paul could not travel, so he was forced to communicate by writing letters. Some of these letters are books in the New Testament. Finally, Paul was granted his trail in front of Cesar. Paul was able to use this opportunity to share the Gospel with the King of the most powerful nation in the world and his family and servants. Because Paul relied on God’s leading, he was able to share the Gospel with people he never would have thought possible. He was able to write letters that are still helping Christians learn more about God to this day. When we trust in God’s design and plan for our lives, we are always better off. It may not seem like it at first. We may even suffer more now as Paul did. But it will be worth it in eternity and we will accomplish things that seemed impossible, just like that little bird who can walk under water. What is something hard that God asks you to do? Does God what us to be happy in this life? Would God ever ask us to jeopardize our happiness, comfort, or safety for him? How to we have enough faith to trust God even when we cannot see a good outcome? 1. Venturi. “The American Dipper, An Underwater Bird.” (July 31, 2017). San Bernardino County Sentinel online. Accessed December 2, 2018 from http://sbcsentinel.com/2017/07/the-american-dipper-an-underwater-bird/.